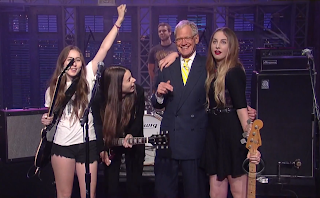 California CoSign’d sisters Haim stuck around New York City following their muddy set at Governors Ball this past weekend for a Monday night appearance on Late Show with David Letterman. Without a proper album to support, the three (well, four counting drummer Dash Hutton) turned towards their recent single, “Forever”, which especially impressed ol’ Dave himself. Catch the performance below (via The Audio Perv). In related news, Alana and Danielle Haim recently told Gigwise that their as-yet-titled debut album is on the way. “We like to keep it a secret,” Danielle explained. “The record is the only thing we’ve only ever kept a secret in our entire career because it’s our baby. It’s so close to being out and we’re super excited about it.” Fingers crossed that’s before summer’s end.